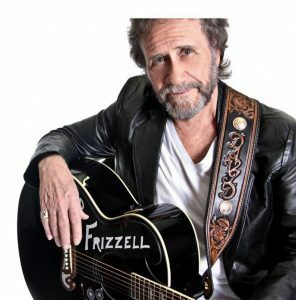 David Frizzell is a highly respected traditional country singer who charted a number of hits in the 1980s. He was a frequent duet partner of Shelly West, the daughter of country star Dottie West. He himself is the younger brother of the late, legendary Lefty Frizzell, the great honky-tonk singer who achieved the peak of his popularity during the 1950s. Lefty died in 1975. David’s expressive voice has often been compared with that of his brother. David Frizzell has been honored with several awards from the Country Music Association (CMA), Academy of Country Music (ACM), Billboard, and Music City News during his career. He continues to perform as well as to be engaged in various other creative projects today. David Frizzell was born on September 26, 1941, in El Dorado, Arkansas—13 years after his famous big brother. When Lefty was a major star in the mid-‘50s to early ‘60s, the youthful David would often perform as part of his brother’s stage show. David also began recording his own country and rockabilly songs for various labels in the late ‘50s. 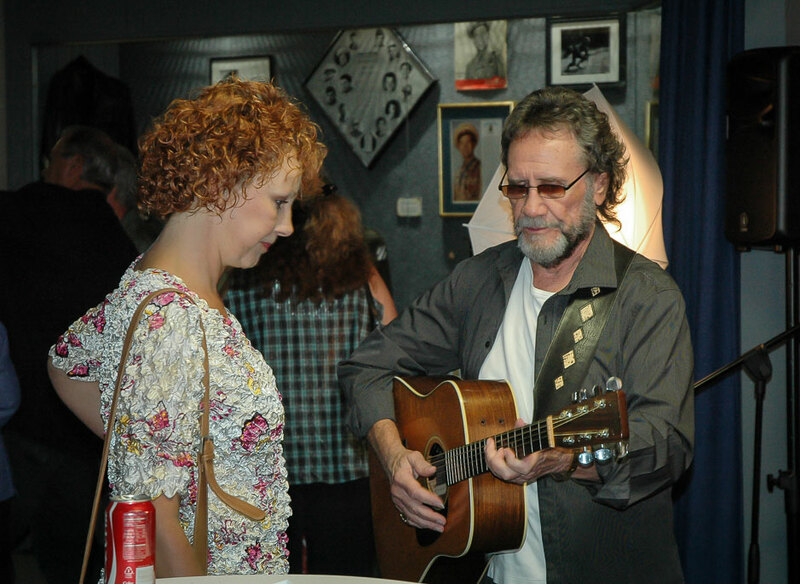 David Frizzell and Shelly West discussing a song during a break at a reception held at the Willie Nelson Museum in Nashville, TN at the opening of the Frizzell-West exhibit. During the Vietnam War era of the 1960s, David served in the U.S. Air Force for four years. Afterward, he returned to his music career, seeking success as a solo artist. In 1970, he broke into the country top-forty for the first time with “I Just Can’t Help Believing” (the same song with which B. J. Thomas had a pop hit that same year). That would be Frizzell’s last highly charted song for several years. However, he kept making records, touring, and appearing on country television shows, hoping for his big break. That big break finally came in 1980, when he teamed up with Shelly West, another singer with a famous country-music heritage. The two singers released an album together in 1981 titled Carryin’ On the Family Names. 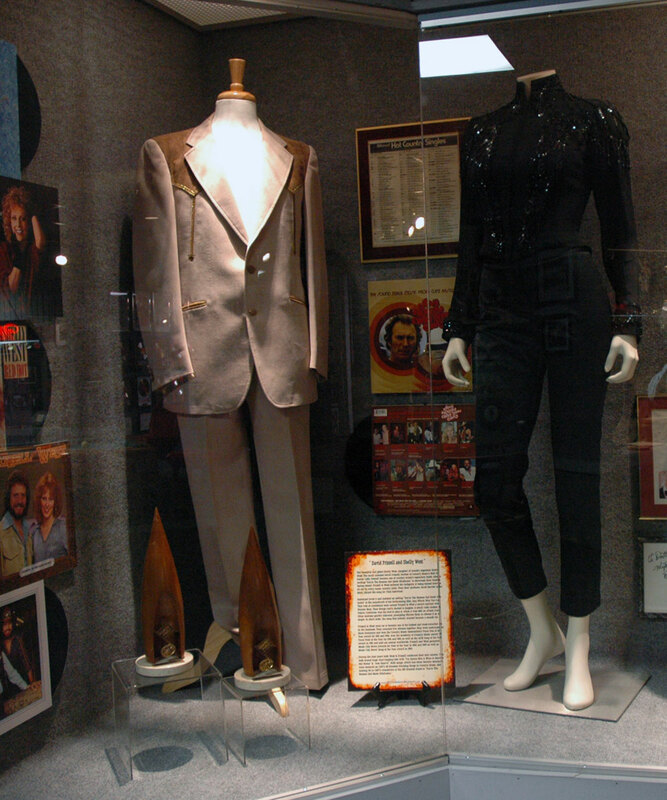 A duet from that album, “You’re the Reason God Made Oklahoma,” climbed to the number-one spot on the country charts. West and Frizzell were named the Vocal Duo of the Year by the CMA in 1981, and they received Top-Vocal-Duet honors by the ACM. David Frizzell and Shelly West Exhibit. David Frizzell and Shelly West were honored again in 1982 by the CMA with Vocal Duo of the Year, and by the ACM with Top Vocal Duet. 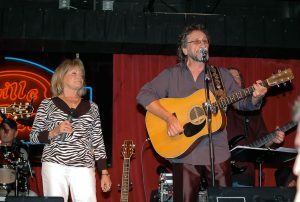 The two singers toured together regularly through the mid-1980s. “Another Honky-Tonk Night on Broadway” with David and Shelly. David’s only number-one solo hit came in 1982 with “I’m Gonna Hire a Wino (To Decorate Our Home),” a honky-tonk-style song that sounded like it could have been recorded by Lefty. Written by Dewayne Blackwell, it has been named by CMT as one of country music’s 40 greatest drinking songs. David performing “I’m Gonna Hire a Wino (To Decorate Our Home)” on an awards show. David’s 1982 recording of “Lost My Baby Blues” made it to the number-five position. In 1983, “Where Are You Spending Your Nights These Days” made it into the top-ten, and “A Million Light Beers Ago” broke into the top-forty. 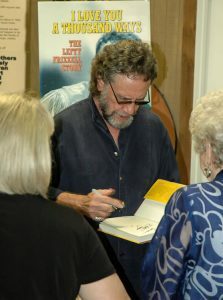 David Frizzell autographing his book for one of the many fans who came to his book signing at the Willie Nelson General store in Nashville. 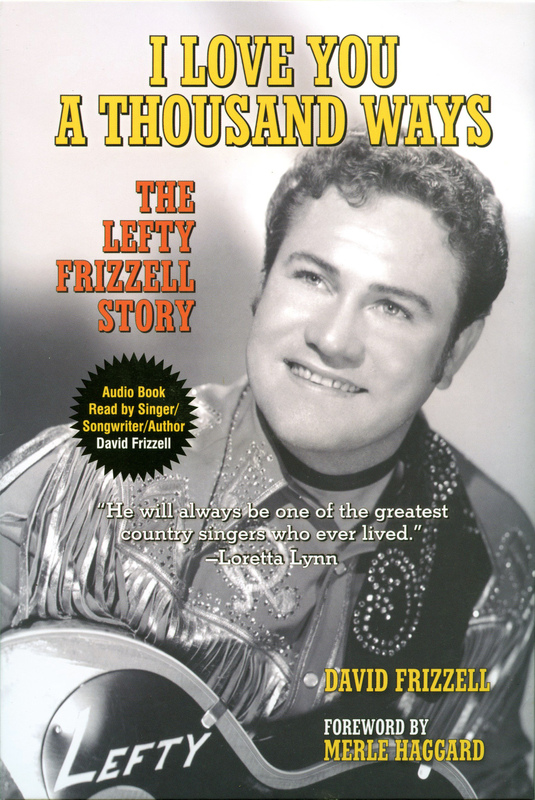 David Frizzell’s book titled “I Love You a Thousand Ways” about his famous musician brother named Lefty Frizzell. David’s recording productivity declined after the ‘80s, though he has released several albums since then and he continues to perform concerts across the country. Moreover, he has been involved with numerous other creative ventures. 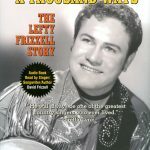 In 2011, David’s tribute book to his big brother, I Love You A Thousand Ways: The Lefty Frizzell Story, was published by Santa Monica Press. CMT named it as one of the best music books of the year. The audio version of the book features David’s heart-felt and emotional narration, along with some of Lefty’s music. His Frizzell and Friends series of CD, DVD, and television collaborations have brought together some of country music’s top performers. Guests have included Merle Haggard, Jeannie Seely, Crystal Gayle, Bobby Bare, Gene Watson, Johnny Rodriguez, Johnny Lee, Joe Stampley, T. Graham Brown, Lacy J. Dalton, Helen Cornelius, Amy Clawson, and others. David and Buddy Hyatt perform “Say Hello to Heaven” on one of the Frizzell and Friends TV specials. The song, written by Hyatt, is meant to raise awareness of the dangers of drunk driving. David Frizzell and Helen Cornelius performing together at the World Famous Nashville Palace. David organized a special project for the Buddy Holly Educational Foundation, a charitable group dedicated to music education. The project culminated in the 2014 release of The Buddy Holly Country Tribute, a 21-track collection (on CD and DVD) that pays homage to the rock’n’roll pioneer. The collection includes cuts from Frizzell as well as Merle Haggard, Helen Cornelius, Jimmy Fortune, T. Graham Brown, and Sonny Curtis. 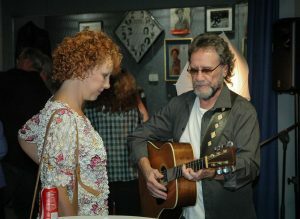 David often stops in to see us here at the Willie Nelson and Friends Museum when he and his wife, Jo, are in town. Although they have been keeping the road very hot lately playing dates all around the country. And the Frizzell family tradition of music continues. David’s youngest brother, Allen, who was married to Shelly West from 1977 to 1985, is a guitarist and country-gospel singer. Tess Frizzell, the daughter of Allen and Shelly, is a Nashville-based country singer.